The Singapore Court of Appeal’s judgment in Vellama d/o Marie Muthu v Attorney-General  SGCA 39 – popularly known as the Hougang by-election case – shows that the Court sees its role as policing the margins rather than involving itself in the heart of politics. The Court held that the Government was incorrect in asserting the Constitution confers on it the discretion not to hold a by-election at all after a parliamentary seat falls vacant. The judgment came as a surprise to those used to a judicial stance fairly deferential towards the Government, but on balance the Court did accord the Government significant deference as it held that the Prime Minister has a fair amount of leeway in deciding when a by-election should be conducted. Furthermore, the Court actually found that the application lacked standing to bring the case, and was reluctant to set a precedent potentially requiring the Government to defend more court cases. 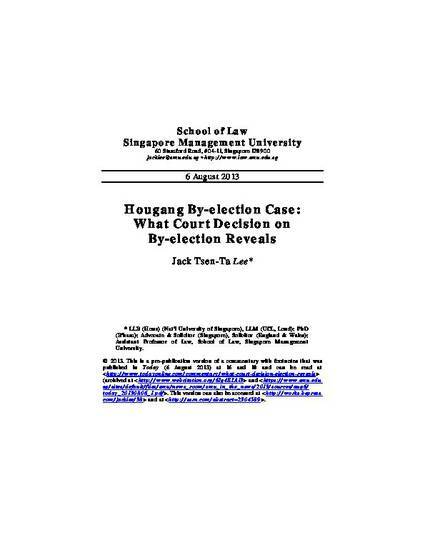 Jack Tsen-Ta Lee, "Hougang By-election Case: What Court Decision on By-election Reveals", Today (6 August 2013), pp 16 & 18. Available at: http://works.bepress.com/jacklee/38.